If you like, use just one type of cheddar or mix with another melting cheese, such as pepper Jack, Muenster, Swiss, or mozzarella. Preheat oven to 375°. Cook pasta, and drain; reserve. Meanwhile, in a 5-quart heavy pot, melt butter over medium heat. Add onion; cook, stirring occasionally, until softened, 3 to 5 minutes. Whisk in flour to coat onion. In a slow steady stream, whisk in milk until there are no lumps. Cook, whisking often, until mixture is thick and bubbly and coats the back of a wooden spoon, 6 to 8 minutes. Stir in cayenne, if using, and 1 cup each yellow and white cheddar cheese. Season with 1 teaspoon salt and ¼ teaspoon pepper. Toss pasta with cheese mixture; fold in ham. Transfer to a 9-by-13-inch baking dish or individual dishes. Set aside. In a food processor, pulse bread until large crumbs form. Toss together with remaining ¼ cup each white and yellow cheddar, and ¼ teaspoon salt. Top pasta with breadcrumb mixture. Bake until top is golden, about 30 minutes. Note: This recipe makes enough to fill eight 12-to-16-ounce baking dishes. 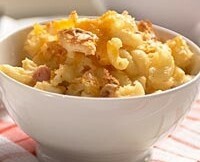 Divide the macaroni and cheese evenly, sprinkle with topping, and bake for 15 to 20 minutes, until golden.